Sometimes you may need to login as an Administrator in Windows 7 for some administrative tasks. As the Administrator account is disabled by default in Windows 7, you can’t use it to login into Windows. Here’s a simple way to activate Administrator account in Windows 7. Open the command prompt with elevated privileges. To do this click the Start Orb then All Programs, click on Accessories, then right-click on Command Prompt and then select Run as administrator. 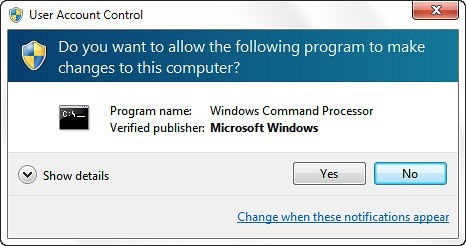 In the Command Prompt, type net user administrator /active:yes and then press Enter. Restart your computer or log off to see the Administrator account in the Windows 7 login screen. Now, just select Administrator to log in as Administrator. Warning: DO NOT use the Administrator account always for your normal tasks like browsing the Internet as it bypasses all security. Use a normal Windows account instead. Can you tell us if you did followed the steps or not? I followed the steps to get the Administrator for windows 7 but I am getting access denied error 5 has occurred. You have to click on Yes to continue. Recently I am also disabled my windows 7 logon prompt screen and suffering this issue… pls help if you got solutions means. Window 7 now Domain user, I am a Administrator, I want to Log on Administrator. How to Log on Administrator? Sorry, I cannot understand your issue. Can you provide some more details? How can i log off as administrator and be able to access all my old file including my music,photos and all my document…I can’t seem to use the internet explorer or google chrome without having to download it again.And when i turn my computer on a message pops up saying `am logged in as a temporary user -andshpould log out and restart computer.Tried this a few times but never worked.Can you help please.